Perhaps a little underused in our gardens, Deutzia are a group of deciduous shrubs that grow well in full sun to light shade. Attractive flowers in spring and good foliage through summer to autumn they are an easy care plant. 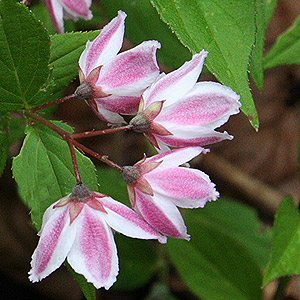 Deutzia species such as D. gracilis and D. scabra are fairly easy to grow, tolerating a wide range of growing conditions. A medium shrub “Deutzia x hybrida pink pompom” produces dense heads of double pink flowers which then change to white, well worth a place in the garden. Deutzia Scarborough Magician reaches around 2m with lovely pink flowers. We like them for the flowers which have a slight fragrance and the easy care nature of the plants. Although they will grow in part shade they do like some morning sun, so a sheltered position with a little protection from the hot afternoon sun is best. Growth will be stronger and flowers more prolific in a position with at least good morning sun. A well mulched soil with well rotted compost dug in before planting. Deutzia will flower late spring to summer and they are best pruned just after flowering to ensure good flowering the following season. Propagation is from semi – hardwood cuttings.